Paul Michael Kane, award-winning photographer and the man behind Foto Grafis, is back on Kickstarter. This time, he’s pushing for the launch of yet another card deck, LightBox Photography Cards. What’s it all about? I’ll let Michael explain. The deck is just as how Paul Michael describes it: a teaching tool designed to inspire photographers—old and new alike—to go out there and shoot. Each card contains a challenge that users could derive ideas out of, giving them a theme to work with the next time they step out to shoot. It’s a noble idea; that’s probably why it got all the backing it needed. As of this posting, the project raised $12,047—a far cry from its $3,800 goal—with 19 days to go. As a product, however, I fail to see the merit in having a deck of cards telling you what to shoot — though I do realize that there’s a market for it as evidenced by the support the project got. I’m already of the belief that there are better photography-related items you could splurge on other than this. In this day and age when sources of inspiration are accessible, I just couldn’t recommend spending cash on cards. In addition, the rewards for pledging aren’t all that exciting. The only notable package is the Education Ambassador deal for pledgers of $100 or more. Here you get 10 decks of LightBox Photography Cards and an additional 10 decks to be donated to the school of your choice. To be fair though, Paul did add “stretch goals” where he adds additional freebies every time the project gets past a certain point during funding like a 3-in-1 grey card as well as a silicone band for lenses. In the end, I wish nothing but success for Paul Michael Kane and all the photographers he would likely inspire. The man seems well-intentioned and creative blocks are an issue in the biz. Everyone got his or her own mountain to climb to succeed in this field and if a deck of cards will give you the extra boost you need to reach the top then go for it. 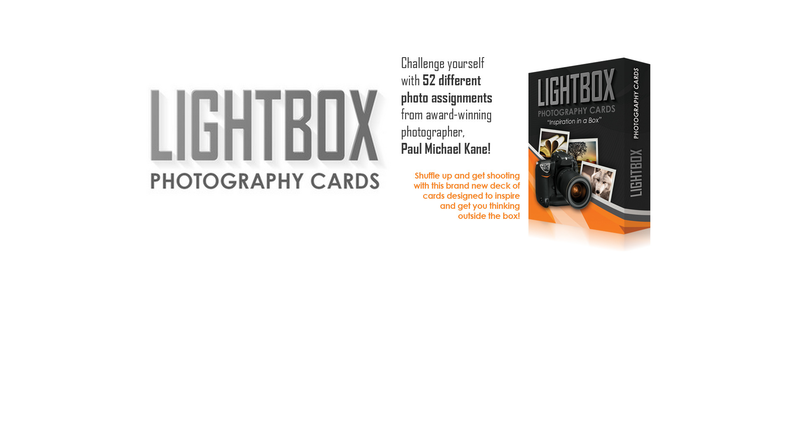 To know more about LightBox Photography Cards, you can check out its Kickstarter page. Rafael Rivera makes a living by writing articles for the web, He started doing photography back in college and has fallen in love with the medium since.